Compared with standard type and high-efficiency type dewatering centrifuges currently used for sewage treatment, the HED type dewatering centrifuge is a new type of dewatering centrifuge that has realized further energy saving. It has not only reduced CO2 emissions as a result of low power consumption but also requires less maintenance and offers space saving and higher performance. We have full confidence in recommending this space-saving, lower-maintenance, higher-performance new HED type dewatering centrifuge. 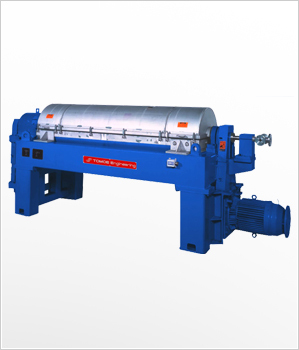 The HED type dewatering centrifuge uses a rotary cylinder that has been ideally designed for the balance between the water load and solid matter, which allows reduction in power consumption (by 30 to 50% compared to conventional types) and CO2 emissions. The vertically installed motor contributes to a 30 to 50% reduction of the required installation space for the dewatering centrifuge. The polymer coagulant can be reduced. The newly designed rotary cylinder has realized a balance between the water load and solid matter and it prevents the separate liquid from being stirred. It also contributes to improving the water content and the recovery rate of the separate liquid. The ultrafine sintered tungsten carbide tiles used at the end of the dewatering centrifuge conveyor significantly slow the progress of wear, allowing to decrease the frequency of repairs and considerably reduce repair costs.